Margin Trading: What Is Buying On Margin? Trading shares on margin allows you to take advantage of trading opportunities as they arise, without having to raise cash by divesting your existing investments or from other sources. Used judiciously, a margin account can be used to effectively diversify or hedge your portfolio. For example, if you are too heavily concentrated in a few stocks or sectors, your margin account can be used to add positions in other stocks or sectors in order to improve diversification. Or if you already own a diversified portfolio and wish to hedge downside risk, you can short sell the broad market or specific sector, or use options for hedging. Recall that short selling, and certain types of options trades, can generally only be done in a margin account (short selling carries its own risks – refer to our Short Selling Tutorial). A carry trade refers to borrowing at a lower interest rate and investing in an instrument that can generate higher returns. While currency carry trades are widely used in the currency market, an astute investor can use it effectively in the stock market as well. For example, assume an investor with $50,000 to invest takes on margin debt of $50,000 and invests the full amount in a diversified portfolio that yields 12%. 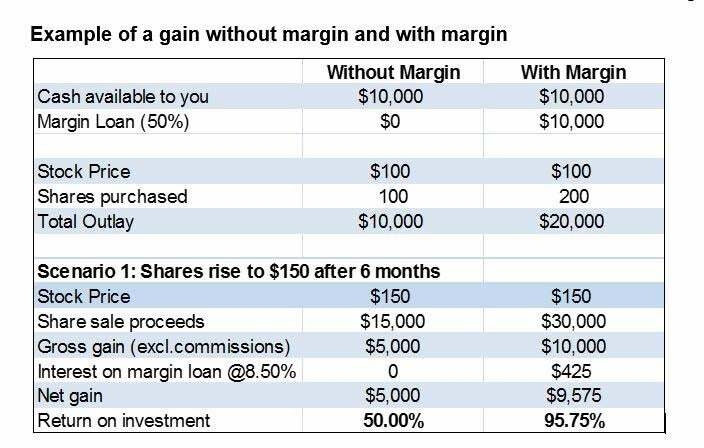 If the interest rate on the margin loan is 8.50%, the investor generates an additional 3.50% (or $1,750) on the overall portfolio, compared to the return on the cash-only or unleveraged portfolio. Margin loans, futures and ETF options can all mean better returns, but which one should you pick? While debt can be a negative, it can also be a positive thing if used properly. Find out how debt can actually make you richer. What’s a Good Profit Margin for a New Business? Surprisingly, the younger your company is, the better its numbers may look when it comes to your profit margin. What's a Good Profit Margin for a Mature Business? How to determine if the amount you clear dovetails with the competition.